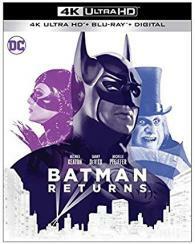 Gotham City faces two monstrous criminal menaces: the bizarre, sinister Penguin (Danny DeVito) and the slinky, mysterious Catwoman (Michelle Pfeiffer). Can Batman (Michael Keaton) battle two formidable foes at once? Especially when one wants to be mayor and the other is romantically attracted to Gotham's hero? Like the 1989 groundbreaking original, Batman Returns is directed by the wizardly Tim Burton. And like the first blockbuster, it's a dazzling adventure that leaves you breathless.